Chef Nate Appleman, Culinary Manager of Chipotle, was one of the talented top chefs on the Zahav culinary tour in Israel. After spending some time with Nate we were thrilled to be able to learn a bit more about his experience in Israel. Delicious Israel: What are your views on the food in Israel? Nate Appleman: It is a cuisine that I am unfamiliar with. I have really only seen it through the eyes of Zahav, Mike’s restaurant in Philadelphia. Now that I’ve witnessed the inspiration first hand, I have gained a greater respect for the culture’s cuisine. My favorite part of the Delicious Israel tour was experiencing the hummus from Abu Hassan. It was important to see the three distinct variations; it shows what hummus can be - it's not just one "flavor". DI: What was the most interesting takeaway from your experiences here? NA: Jewish food in New York is totally different from Israeli food. In New York you would be more likely to find Eastern European rather than Middle Eastern and what I learned is Sepharadic foods. I enjoyed experiencing the differences in cuisine across Israel. It is interesting to see the subtle culinary differences of each area in a country that is so small. DI: What is your favorite thing that you have eaten so far? NA: My favorite thing that I have had was a simple Druze flat bread filled with labane, za'atar spice and a smear of Skhug, an Israeli spicy cilantro paste. DI: Tell us about your professional life, how did you get to where you are? NA: At age 20 I set two goals for myself: to achieve a James Beard Award and to be recognized as a top new chef. When I was 27 I achieved those two goals, I won the Rising Star Chef award from the James Beard Foundation and was named “Best New Chef” by Food & Wine magazine- have you heard of that magazine? NA: That year was a big year for me, it was the same year my son was born. Now, I am the culinary manager of Chipotle. I want this big company to influence the way that people in America look at food. Chipotle’s mission of Food with Integrity is a big part of this movement, because of it focus on naturally raised meats and locally sourced produce. Chipotle used more locally sourced produce than anyone else last year; we define local as within 350 miles, that’s pretty local. Nate enjoyed playing with locally sourced ingredients from Tel Aviv. 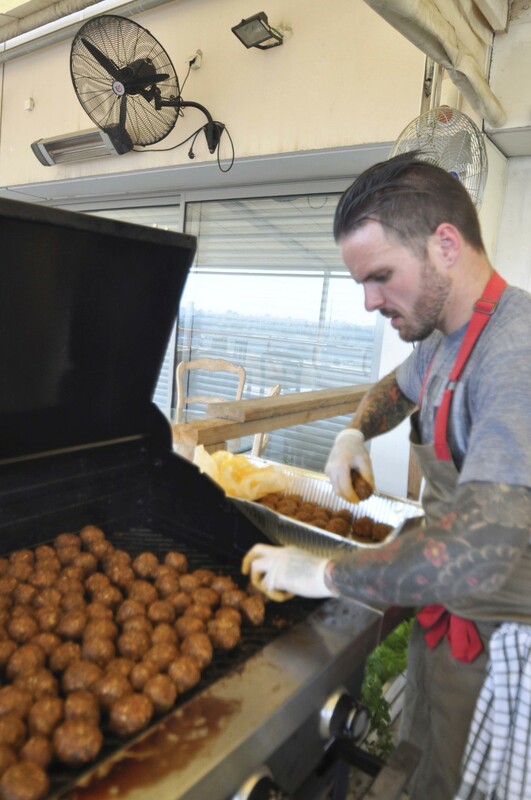 During the Delicious Israel tour, the group of chefs fell in love with Israeli sun dried cherry tomatoes. It was almost difficult to identify them as tomatoes, as they were so sweet and candy-like. In the kitchen on Saturday Nate experimented with the tomatoes, making a beautiful blend of sun dried tomatoes and tahini - a blend we hope to work together to get out to the American market. Keep your eyes out for it! 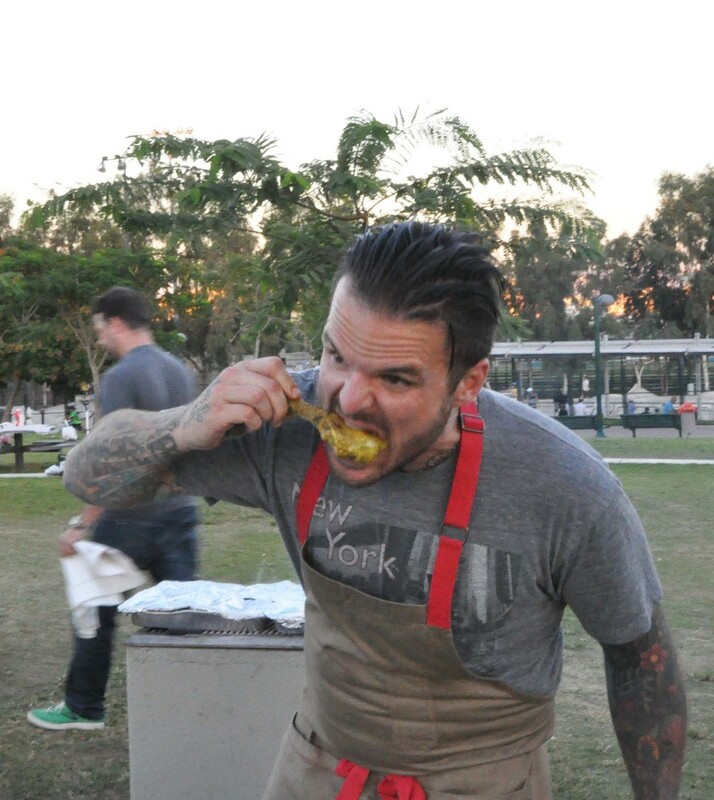 In 2011, Nate was a contestant on All Stars Tournament: Round Three – Notable Chefs and won, progressing him to the Grand Finale, which he also won. In the following years he participated in The Next Iron Chef on Food Network, gaining further recognition for his great talents. We wish Nate a quick return - he has lots more we want him to experience in Israeli cuisine.